A special design of above-ground fire shelter validated by various sophisticated means including computational modelling and contemporary virtual reality (VR) studies for compliance to Australian Building Regulation Council (ABCB) Private Bushfire Shelter Standard 2010. 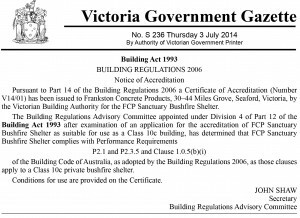 The safety sanctuary shelter is Australia’s first ever Building Regulatory Advisory Committee (BRAC) accredited above ground shelter through rigorous fire tests as per AS1530.8.2-2007 after ABCB Private Bushfire Shelter Standard 2010 was released. The government gazette is attached for accreditation of this shelter.